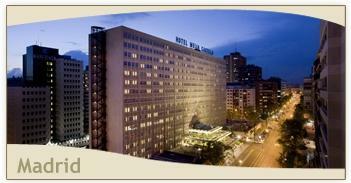 Hotel Melia Castilla, Madrid. Melia Castilla Hotel Madrid. The Hotel Melia Castilla in Madrid is perfect for those want to live the city in its real life: near the most important shopping-centres, the Meliá Castilla will also allow you to have a relaxing stay in its wonderful and well-equipped rooms. The hotel offers wonderful communicating rooms for families.